Hello ... Hello ... my old friends ... It's great to see you once again! The first time that Yours Truly KJS came across Rosie Vela was when I bought her 1986 single "Magic Smile", a Top 30 UK hit from her Top 20 album "Zazu". On either side of "Zazu" (which was largely written by Rosie) was an immensely successful modelling career. 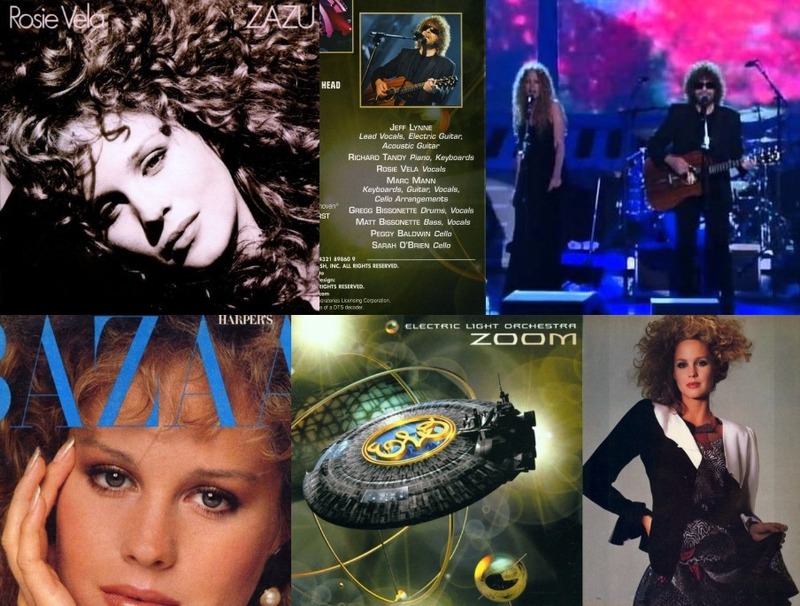 Fast forward to 2001 and ELO fans were reading and hearing the same Rosie Vela as to her contribution to certain tracks on "Zoom" and seeing her performing alongside Jeff Lynne in a new look ELO spaceship at CBS Television City for the "Zoom Tour Live" show in advance of a planned US tour, sadly later aborted. Here in 2017, Rosie is not doing so well. According to an ongoing gofundme campaign entitled Rosie Vela Needs Our Urgent Help! launched by her longtime friends Denice Lewis and Mike Keesling, Rosie is very poorly and stranded in Barbados at present with an expired US passport and no funds to repatriate herself. The campaign goal is to raise $11,000 and if it is successful, Rosie will be able to return home to the States to reside with Denice, undergo urgent medical treatment, recuperate and rebuild her life. At first glance, this story does sound unfortunate (if not unbelievable) but nevertheless it is true. Over the years, elobeatlesforever (elobf) has built a reputation based on independent and trusted sources of information and on that basis currently has no reason to believe that this campaign is bogus. Rosie is a part of the ELO story hence this article. The campaign is also being publicized by my good friend Nicolas Guibert over at elodiscovery.com and Jerry Palovick at A Jeff Lynne And Related Blog. Caught Live : Stand Up & Rock!